In A Tuesday, April 17, 2018, file photo, Claud "Tex" McIver, left, watches defense co-counsel Don Samuel during closing arguments in McIver's trial at the Fulton County Courthouse, in Atlanta. A jury on Monday, April 23, 2018, has found McIver, who fatally shot his wife, guilty of murder and influencing witnesses. 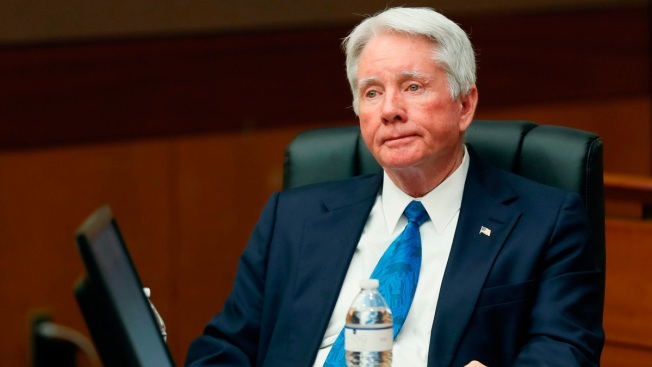 After telling the judge Monday morning that they were stuck and couldn't reach a verdict, jurors deliberated a few more hours before deciding that a well-connected Atlanta attorney intentionally shot his wife, causing her death. Jurors found 75-year-old Claud "Tex" McIver guilty of felony murder and three other charges in the September 2016 death of his 64-year-old wife Diane. The white-haired defendant, wearing a dark suit and tie, showed little emotion as the verdict was read. "We would like to say to Diane, 'We hope that you were watching, and we hope that you felt that we stood for you and we stood for the things you represented,'" Fulton County District Attorney Paul Howard said. That echoed a refrain by Clint Rucker, the lead prosecutor in the case, who repeatedly urged jurors in his closing argument to "Stand up for Diane." No one has disputed that McIver shot his wife. Defense attorneys said at trial that McIver loved his wife dearly and Harvey called it "an accident in search of a motive." Prosecutors argued, however, that McIver intentionally killed his wife because he was in dire financial straits, his life was spinning out of control and that he depended on her financially and coveted her money. Police initially charged McIver in December 2016 with a felony charge of involuntary manslaughter and a misdemeanor charge of reckless conduct. Prosecutors began investigating in January 2017 and quickly began to suspect it wasn't an accident, in part because the gun was in perfect working order and required a significant amount of pressure to fire when it wasn't cocked, Rucker said. By late morning Monday, after roughly three and a half days of deliberations, the jury sent Fulton County Superior Chief Judge Robert McBurney a note saying they didn't see a path to agreement on four of the five charges. The judge sent them to lunch and then instructed them to keep deliberating. McIver also was found guilty of possession of a firearm during the commission of a felony and influencing witnesses. The influencing witnesses charge stems from McIver's having told the driver of the SUV and only witness to the shooting to tell police she wasn't present when the shot was fired. Dani Jo Carter, a close friend of Diane McIver, was driving the couple's Ford Expedition the evening of Sept. 25, 2016, as the three returned from a weekend at the McIvers' horse farm about 75 miles (120 kilometers) east of Atlanta. Diane McIver was in the front passenger seat and Tex McIver was in the back seat behind his wife. Diane McIver's boss and mentor, Billy Corey, told reporters he began to believe within days of the shooting that it was no accident. He said justice was done. "May Diane rest in peace," he said. "They stood up for Diane today."